GaryMoller.com - Health, Fitness - Naturally! Gary Moller's old blog about health, fitness, nutrition, medicine, lifestyle and related topics. I just thought I would contact you with regard to some knee pain I've been experiencing for the past 2-3 weeks. It is occuring in my left knee and is generally experienced at the beginning of a run i.e. the first 800m to 1km (even at a very easy pace) and when performing strides (both after a warm-up and at the end of a longer run). Often in the course of a long run the pain will ease and won't bother me allowing me to continue, but in a 13km run yesterday I was also aware of it towards the end of the run and during downhill sections. When not running it is generally not an issue, but it is particularly uncomfortable when performing lunges on that side and single leg squats. Furthermore, when performing such exercises (both) knees tend to make rather disconcerting crunching and clicking sounds. 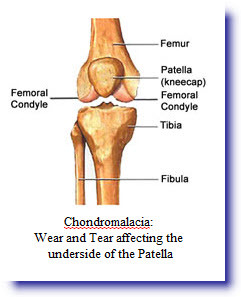 The most common cause of the pain you are describing is "Chondromalacia" (Refer illustration left). It most often appears in runners in their 20's and is associated with an increase in training and competition, including doing unfamiliar running drills, including over-striding, bounding up steps. Worst of all is running downhill. Another cause may be sore calf muscles which cause compensatory flat-footed striding with the backside dropping to the ground similar in appearance to running in a seated position (Bent knees has the patellae grinding hard on their femoral grooves). Anything that causes excess grinding of the patellae on the underlying femoral groove will cause knee pain and a feeling of grating or grinding under the knee cap. The cause of chondromalacia is usually never just one thing: It is usually a combination of several things all coming together to cause excess wear that exceeds the body's ability to repair. This includes lack of recovery time following hard races and following training. An occupation that involves a lot of bending at the knee, walking down stairs and even sitting for long periods with the knees bent may compromise repair of wear of the underside of the kneecaps. Nutrition is important. If there are deficiencies or excesses of various nutrients, then repair may not be speedy and the repairs soft and weak. Glucosamine and chondroitin may assist and well worth taking for a period of three months at the daily recommended dosage. A Hair Tissue Mineral Analysis assists with determining any nutritional weaknesses may be contributing to wear exceeding repair. If your knees are still bothering you, I think it is best to have a break of several days. Do some swimming and aqua-jogging. Get going with the glucosamine and chondroitin, ensure your diet is rich with protein and quality fats. While you are settling the knees down, try to identify everything that might have contributed to the knee pain and work out how to avoid these in the future. For example: Put in place the rule that you will have a relative rest day for every mile raced. So, if you raced 10 miles today, you do no running for the next two days then gradually resume to full training over the remaining 8 days. Got the idea? Back to now: As your knees settle, resume running with care, just with jogging on a flat grassy surface. Run tall as if you are held up by a bungy cord attached to the top of your skull. If you have tight calf muscles, then get them massaged deeply and painfully on a weekly basis for as long as it takes for the deep massage to be pain-free. Get your quads, hamstrings and gluteals done while you are at it. It is important to be patient and thorough when dealing with any kind of knee pain. Your knees have to last you many, many years. Please don't ruin them while so young. The advice in these articles is given freely without promise or obligation. Its all about giving you and your family the tools and information to take control of your health and fitness. Please give me your support by subscribing to my free email updates. Please shop at my Online Store. Please encourage your family and friends to do the same. While we may not always be able to compete with the big operators on price, we aim to more than compensate through personal service! Do you have a question? Email Gary: gary@myotec.co.nz. Include any relevant background information to your question. Please be patient and be aware that I may not be able to answer every inquiry in detail, depending on workloads (My paying clients take precedence!). I will either reply by email or, most likely, by way of an article (Personal identifying details will be removed before publication). i'm a swimmer and have an aching shoulder, it even "ticks" i often hae the feeling that its just gonna pop out of my shoulder... is this the same? I have shin/calf muscle pain just two weeks out from running a marathon! Heel spurs - Is there any danger in one cortisone shot to each heel? If you are bothered by candida or any yeast and fungal infections: This comprehensive E-Book by Dr Eric Bakker is your best guide to a life-long relief! Except where expressly stated, Gary Moller makes no representations about the content and suitability for any purpose of the information contained in the Web Site. It is provided 'as is' without express or implied warranty of any kind. Gary Moller disclaims (to the full extent allowable by law), all warranties with regard to this information, including any advertisements, including all implied warranties as to merchantability or fitness for use. Gary Moller shall not be liable for any damages whatsoever including any special, indirect or consequential damages resulting from loss of use, data or profits, whether in an action in contract, negligence or other tort, arising out of or in connection with access to the Web Site or the use or performance of information contained in it. The advice given in the Web Site is for education purposes only and should never be used to over-ride professional medical advice or intended to preclude consulting a medical practitioner. Gary Moller. Simple theme. Powered by Blogger.